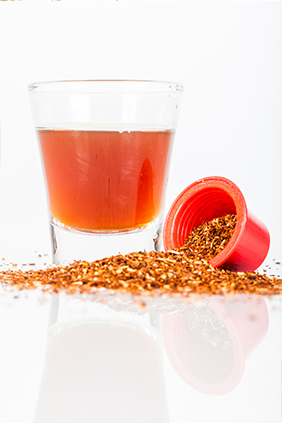 Espresso made from Rooibos is a South African invention that offers a healthier alternative to espresso lovers. 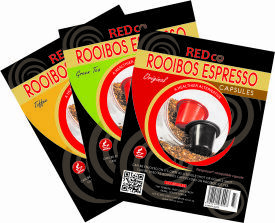 Rooibos Espresso has a strong slightly nutty flavour with a clean finish. It is naturally caffeine free and contains 10 times more antioxidants than regular Rooibos itself. Like coffee-based espresso capsules it is ideal for making lattes and cappuccino-style drinks. The double shot espresso is a perfect base for a Ice Tea on a hot day. Our capsules are Nespresso® compatible and offer a great alternative to coffee. We can also offer Rooibos in other variants of capsules such as: If you have any trade inquiry or suggestion please contact us. Our Rooibos extract is sourced from the Cederberg region and carry the seal of quality from Rooibos Limited, assuring you the best quality of Rooibos. REDco also provides high quality Espresso Coffee machines for your home, office or business.